We had promised our members that we would try and find out more about the planning and feedback process and hoped to be able to post details on the website. Unfortunately, even the simplest questions end up requiring huge amounts of detective work. Take, for example, our simple desire to find out when the deadline for feedback for the public consultation is. After weeks of trying, we were finally given an answer by the planners. To our shock, and that of our members, we have been told it was on the 13th September, less than 2 weeks after the first exhibition. Silly us, we should have realised! Obviously it’s asking way too much to expect this date to have been displayed at the exhibitions (it wasn’t), to be printed on their leaflets (it wasn’t) or made available through the websites of the community councils (nowhere to be seen). How totally unreasonable of us to think that it should have been printed at the bottom of the feedback questionnaires people were asked to fill in and send back (by when?). Downright churlish to expect it to appear on the Craighouse Partnership website (nope) alongside the details of how to send in our comments and views. In fact, unless you happened to be in the right place at the right time: ie reading the Public Notices section of the Scotsman on the 25th August 2011 (copied to the right), you wouldn’t have seen it at all. Unfortunately, we weren’t and neither was a single one of our members who came to the meeting last night and were, understandably, pretty upset about it. The only way the Friends managed to find out was by putting in a letter of complaint to the planning department. 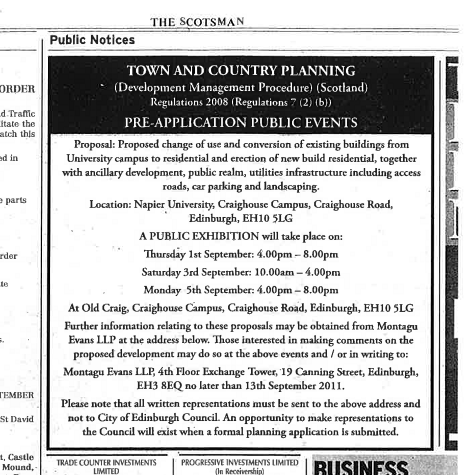 But even the planning department didn’t know (obviously they hadn’t happened to be reading the notices section of the Scotsman on the 25th August either) and had to send off for a copy of the advert from the developers before they knew. The planning department confirmed the developers can ignore any comments made after the 13th September. Any letters you wrote or emails you sent (and ours!) after that date can be kept by the developers and not sent onto the planning department. The developers could, of course, choose to send on such comments to the planning department when they put in an application…or they could choose not to. They could even select the comments sent in after the 13th that they wish to send into the planners, according to their preference. There may be a perfectly reasonable explanation for such a short deadline. It may be that the developers wanted time to respond, or to encourage people to send in comments early. So, why make it so hard to find out what the deadline is? The official address for comments on the Scotsman advert is different to everywhere else – Montagu Evans, a property consultancy. But in the exhibitions and online, we were told to submit comments to Invicta PA, a lobbying company. Could comments sent to Invicta PA be selectively sent on to the planning department as part of the developer’s official report, while only comments sent to Montagu Evans are required to be sent? We just don’t know. We have asked the developers for an explanation of the dates and difference in contact details, and to reassure the community that they will be including all comments made to them after the 13th September in their consultation report to the council. So far, they have said they will “take all responses into account”, both before and after the 13th September. But on the issue of whether all responses will be included in their statutory consultation report to the council, they have been silent. We have asked 3 times now, and they have not made any commitments about including all comments from the community in the statutory consultation report. The council planners and politicians will use the statutory consultation report to gain some understanding of the views of the community. The developers may choose to use the statutory consultation report to support their case for the development. But, they have not committed to including all comments from the community in that report so how can the local community know that what is presented to the planning department is a fair and accurate representation of the feedback given to the developers? The Craighouse Partnership in a newsletter said there will be a further round of exhibitions. Does this constitute a new consultation process? No, it doesn’t – therefore this second round would be outwith the statutory deadline for feedback – therefore no feedback from this second round is required to be sent to the planning department. In short, the Partnership could cherry-pick the feedback that they send in – and use this second round to dilute any negative feedback from the first round. We very much hope that The Craighouse Partnership have no such intention and eagerly await a commitment on this. We will continue to seek a commitment. But, so far, it has not been forthcoming. We will keep asking the questions and hope to post a response as and when we get more information. 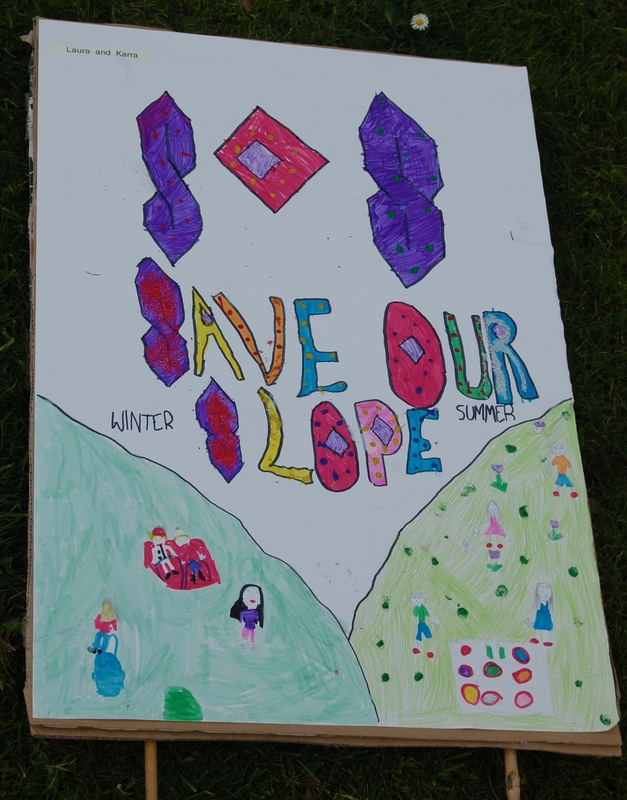 The recommendation that we have been given is: keep anything you say to the developers, (you can copy the Friends in if you like), as well as local politicians, and then resend it once the planning application is in. The 21 days (we are told in this case 28) after the planning application is submitted is ABSOLUTELY CRUCIAL. The Friends will do everything they can to keep our members and the public informed so that when that application goes in you can make your voice heard. This entry was posted in Consultation, Planning process. Bookmark the permalink. To be honest, I can’t imagine why a consultation exercise run by the developers themselves is given any weight or has any credibility whatsoever. It simply cannot be objective as they obviously have an interest in promoting views that support thier intentions. I can’t for the life of me see any motivation for the developers to either collect or report the views of the public transparently, fairly or objectively. Without an impartial and skilled third party involved in collecting, analysing or disseminating the findings, it’s a simply ludicrous part of the process and completely unnessesary as they’ll be another ‘official’ consultation run by the planners anyway. I guess the upshot is that the developers have tested the temperature of the public in advance of the formal process and could take account of these in re-submitting the plans. Who knows.